At Our Lady and St Anne’s church, baptisms of babies and small children take place at 12.00 noon on the first Sunday of each month. Fr Patrick likes to meet with the parents asking for baptism for their child/ren at least once before the baptism. Please ring the office on 0118 947 1787 to make an appointment. You can complete an application form yourself from the link below and bring it with you or you can fill one in with Fr Patrick when you arrive. Remember that at least one of the parents must be a practising Roman Catholic, and the other must be supportive. During the service you will make promises that you will bring-up your child in the practice of their faith. Choose godparents carefully. Each one must be a baptised Christian, and at least one must be a practising Roman Catholic. Indicate on the form which date (or a selection of dates) would be suitable for you for the baptism to take place. The Parish Office will be in touch with you soon after the application form has been submitted. 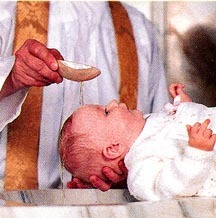 Remember that the Sacrament of Baptism is not administered during the Season of Lent. If you are not resident in the Parish of Our Lady and St Anne you will need the permission of your own parish priest for your child to be baptised here.